The feature-film biopic tends to suffer from time crunch, forcing either a condensed encyclopedia entry of a life in full or a narrow focus on a pivotal era. 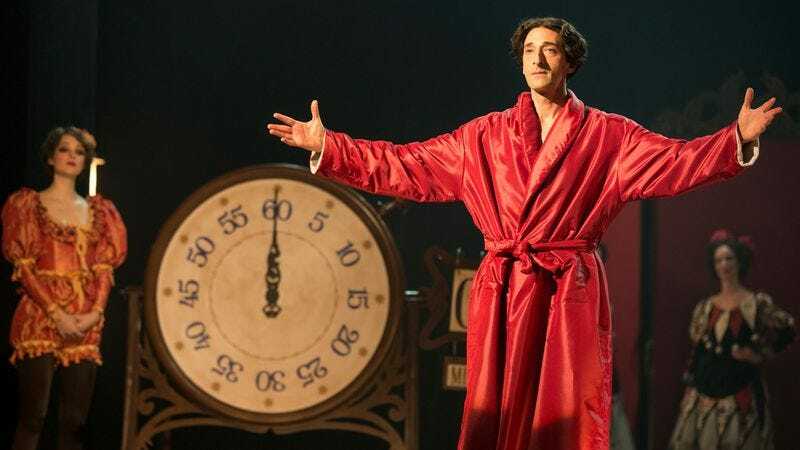 In theory, then, History Channel’s Houdini is in the sweet spot: a four-hour event (with three hours of content) debuting on a network ostensibly dedicated to just this kind of reminiscence, in an era where movie stars dabble in TV ever more routinely. And Houdini has every trapping necessary for a good magic show. It landed an A-list star (the History Channel has trumpeted Adrien Brody’s Academy Award win like it’s going out of style). It’s a gorgeous production that evokes the lushness of the Gilded Age. The slick camerawork feels cinematic even amid the occasional green-screen intrusion. The evocative soundtrack carries echoes of The Knick, which is fortunate or unfortunate depending on personal tastes for period-piece electronic scores. Houdini even has a script by Nicholas Meyer, an Oscar nominee for The Seven-Per-Cent Solution, a hidden history of Sherlock Holmes that deconstructed the man beneath the myth. In itself, Houdini’s script is solid. Amid obligatory childhood flashbacks and check-in exposition, it neatly separates two major periods of Houdini’s public life—his career as a magician and his crusade against spiritualism—with a recently suggested aspect of his private affairs (Houdini the spy!). And though it doesn’t always succeed, it tries to give some due to Houdini’s wife and mother, both of whom shaped his life. But subtlety might be a bit much to expect from Body Of Evidence director Uli Edel, whose credits include similar well-meaning-but-direct-to-TV work in The Mists Of Avalon and Rasputin. And beneath the occasional Guy Ritchie flourish, Houdini is a story Edel is clearly excited to tell. By itself, the directness isn’t particularly a drawback: Houdini’s story requires enthusiasm and a sense of humor, and if it’s all a little too much flash, that’s easy to forgive in a story about a magician. The behind-the-scenes glimpses into some of Houdini’s greatest tricks are deft winks to our own enduring curiosity, a knowledge Edel exploits nicely during tense moments onstage—tense not because the audience thinks he won’t make it, but because they know what he’s in for as soon as the clock starts. (Evan Jones, as Houdini’s longtime assistant Jim, convincingly conveys that assisting Houdini’s a damn fun job, but he gets little else to do.) There are cutaways to symbolic torso-pummelings every time Houdini gets terrible news, which have the on-the-nose exuberance of the escape artist’s silent film work, and the glimpses of his mother in women he meets after her death are familiar but not overbearing. But with all that voice-over, any nuance or resonance has to fight to get out, which means its leads deserve all credit possible for their fighting. Brody is an inspired choice, someone whose presence draws inward rather than commanding attention from the off; his Houdini has both soft-spoken practicality and magnetic showmanship. His signature languid focus works as well in boardinghouses as it does in the Hippodrome, and his restless enthusiasm becomes believably brittle in the character’s later years, when he becomes fixated on debunking spiritualists—a quest in which the victories only cause grieving. Kristen Connolly brings a wry warmth to Bess Houdini, and though she gets relegated to “concerned spouse” as Houdini’s career takes off, her early stage-scenes with Brody have an easygoing chemistry, making what could be a prologue into a charming journey to the top. In one of the series’ best moments, they get confronted about an act gone sour, and in its wake they share the silent, guilty connection of two people forced to confront the myopia of performing life. It’s no coincidence that the moment retains its power largely because of the silence. It’s moments like this that seem like there’s a bad trick being pulled. The reflection, nuance, and connection of the series’ quieter moments are routinely swamped by Brody’s voice-over, reminding everyone that he was an escape artist who never knew quite what he wanted to escape. Houdini has everything it needs to be an engaging deconstruction of a man whose life was a fitting combination of self-constructed myth and ruthless, pointed pragmatism. It’s just unfortunate Houdini never really lets you engage.